Designation: College of Engineering, Swansea University. 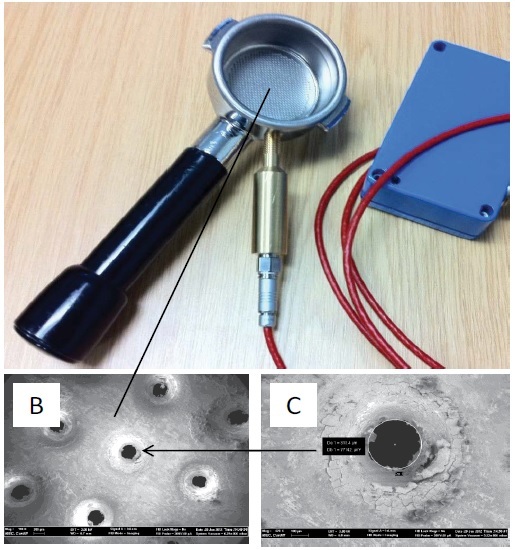 List of Author(s): Griffiths CA, Adams GC, Rees A.
Citation: Griffiths CA, Adams GC, Rees A (2018) Wear Monitoring of Coffee Grind-On-Demand Burrs Using Precision Sieving and Laser Diffraction. Int J Food Biosci Vol: 1, Issu: 1 (34-41). Copyright: © 2018 Griffiths CA. This is an open-access article distributed under the terms of the Creative Commons Attribution License, which permits unrestricted use, distribution, and reproduction in any medium, provided the original author and source are credited. The popularity of espresso coffee (EC) is based on the greater sensory satisfaction it gives to the consumer when compared with coffees prepared through alternative brewing methods. The quality of an EC is largely governed by the relationship between the extraction process and the controllable size distribution of the ground roast beans. This research presents an experimental study on two methods for measuring the particle size distribution. It was concluded that permeability of the water through the coffee is highly influenced by the ratio of grind sizes and fine tuning of the grind for EC extraction. 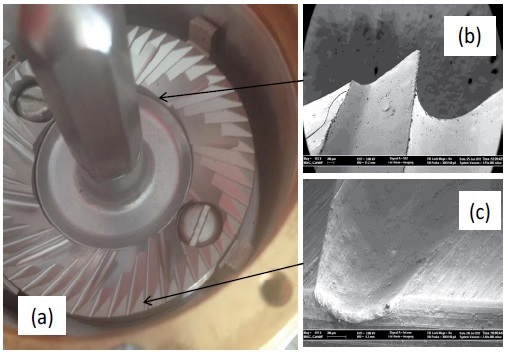 Finally, the results demonstrate that there is variation in the precision control of particle size distribution due to damage and wear of the grinding burrs, and by monitoring this distribution a prediction of burr replacement can be made. Espresso coffee, Grinding, Precision sieving, Laser diffraction. Worldwide, coffee is the second most traded commodity after petroleum and it is the second most consumed brewed drink. Coffee is consumed by a large proportion of the human population (about 70-80%) and seventy-five per cent of soft drinks consumed regularly are coffee beverages [1,2]. The popularity of coffee is not only due to its pleasant taste and aroma but also it is a consequence of its stimulating qualities. The types of coffee beverages and the modality of consumption are tightly associated with social habits and cultures of different countries . During the past few years, evidence of the benefits of coffee on health  particularly its contribution to the intake of antioxidants in the diet [5,6] has helped to increase its consumption . Coffee is a beverage that is carefully prepared by the extraction, in heated water, of soluble material from roasted and ground beans. The ideal beverage is considered to be a brew that has extracted 18- 22% by weight of the solids in the grind [8,9]. The outcome of the extraction process is critical to the resulting taste. In particular, the under extraction of coffee results in a weaker sour tasting beverage, as the acids in the bean are among the first to dissolve, while the over extraction (22-30%) produces a bitter tasting beverage. To obtain ideal extraction conditions, the temperature of the water used in brewing coffee should be between 85ºC and 95ºC [8-13]. When instant coffee is not used, the extraction methods vary on a geographical and social basis where individuals choose their preferred beverages at higher or lower rates of extraction. The differences can range from true solutions (e.g. drip filter coffee), to emulsion-like (e.g. Nordic boiled coffee) or thick suspensions (e.g.Turkish style brew) . The popularity of the espresso coffee (EC) is based on the greater sensory satisfaction it gives to the consumer when compared with coffees prepared with other brewing methods. In EC, ground coffee is placed in the porta-filter fitted to the group handle and the coffee is compressed into a coffee puck using a tamper. The group handle is then fitted to the group head and the extraction process can begin with heated and pressurized water transfer through the fine coffee grounds. The characteristics are therefore different to gravitational extracted filter brewed coffee with its coarser grade of coffee grounds and high permeability. In particular, the brewing technique for EC provides a high amount of coffee concentrate and has extraction rates as high as 25%  and the after-taste, which can last up to 15 minutes, has been found to relate to the beverage properties of the thin layer of foam known as the crema which is the surface gas enclosed in deteriorating oil bubbles . In addition, surface tension related phenomena, such as foam and emulsion formation and stabilisation are shown to strongly affect the organoleptic beverage properties . In the UK alone, 70 million cups of coffee are consumed daily, and 1 in 10 adults visits a coffee shop every day . The UK consumer coffee shop market is currently growing at a rate of 12%, and the existing 14,000+coffee shops deliver 5 billion (£) worth of sales per annum. The biggest chain in the UK intends to expand by 50% and open another 600 shops by 2016 while the global market leader, which owns about 20,000 stores worldwide, plans to open 300 new UK stores . Many other brands are following this trend, making the provision of high quality coffee an objective of prime importance for business success. There are many factors that influence the quality of EC, and the relationship between the extraction process and the control and quality of the ground roast beans is critical. In this paper, the grinding of roast beans and the measurement of the resulting particle sizes is investigated in the context of preparing espresso coffee. In particular, grinding tests are performed to characterize the distribution of the size of the coffee particles. By comparing grind sizes measurements from new and old burrs the identified precision sieving and laser diffraction measurements will be used to evaluate when the burrs need to be changed. The paper is organised as follows. The next section reviews techniques used for the grinding of roasted coffee beans. Then, the experimental set-up used to investigate coffee particle size distribution as a function of the grinding method employed is described. Finally, the experimental results are presented and the capabilities of different grinding measurement methods is analysed. There are many conditions such as pressure, temperature and water flow rate that must be considered when performing EC brewing. This aspect of coffee preparation has been studied by a number of researchers over the years. One important area that is less well understood is the importance of particle size distribution in the grind . A range of odorants are responsible for characteristic notes in the odour profile of EC brews prepared from roasted Arabica and Robusta coffee varieties. The compounds that make up these odorants can be used as objective indicators of flavour differences from the raw materials, green coffee processing, roasting, grinding, storage, and the brewing procedure . After the grinding of roasted coffee beans, the released odorants can be equally or more attractive to those of the beverage aroma. However, these aromas are highly volatile and unstable compounds and therefore they are lost shortly after grinding . The grinding procedure causes the rupture of coffee bean tissues and cells and accelerates the release of CO2 and volatile aroma that are critical for the formation of the crema layer. The particle size distribution after grinding influences the flow rate of water through the quantity of coffee in the porta-filter basket usually referred to as the coffee puck. The main objective of the grinding process is to control the distribution of particles to achieve suitable fluid dynamic conditions in terms of the optimum surface area to the action of heated water . An optimised combination of grind size and extraction conditions can facilitate the transfer of soluble and emulsifiable substances and the aroma into the coffee beverage . Depending on the grinding technique used, the particle sizes can range between 0.2 μm and 650 μm  with the finer grind size resulting in the soluble components being extracted more quickly and in a shorter time. Thus, the various brewing methods have different ideal grind sizes . The relationship between the particle sizes and the brewing process is critical as a very fine grade can lead to over extraction, resulting in a bitter coffee. This is in part due to the reduced flow rate, higher infusion pressure and additional liquid to coffee contact time results in the extraction of bitter components and toxins. When water flows through the coffee grounds at a fast rate there is limited infusion pressure and therefore limited infusion. Therefore, a grinding grade that is too coarse can result in an under extracted coffee due to the fact that the total surface of contact of the particles becomes too small to absorb the water and then allow the coffee solubilisation and emulsification. Generally, fine grinds are needed for EC, and extremely fine grinds are required for Turkish coffee . The influence of grinding on the extraction process has been studied in [25,26] with a particular focus on the influence of the grade to water ratio on caffeine extraction. For brew coffee, when the grinding grade is finer, the extraction of soluble and volatile compounds is higher  and the grade is shown to affect the velocity of water and therefore the extraction of substances . Each of these studies claimed that small particles increase the surface exposed to water, permitting a more efficient extraction process . EC is a multiphase system constituted by an aqueous solution of sugars, acids, protein-like material, caffeine, an emulsion of microscopic oil droplets, a suspension of solids, and crema foam of small bubbles on the top. With a high solids concentration in terms of the increased coffee volume due to finely compacted particles and extraction time is short, 15-30 seconds, and the control of the grind is essential for producing a flavourful coffee beverage [29,30]. The foam volume, persistence, and consistence are the consequences of the carbon dioxide content originally present in the coffee Beans, and EC brewing can be described as “a quick way to transfer carbon dioxide from ground coffee by means of hot water under pressure” . This relationship between crema and carbon dioxide also extends to the grinding process. For 500 μm coffee grind particles, it has been shown that over 70% of the locked CO2 formed in the Maillard reaction from the roasting process was released following coffee grinding, therefore to limit the detrimental effect of the CO2 loss on the formation of crema it is necessary for EC to be prepared shortly after grinding . It has also been reported that the time range of 0-30 minutes is the ideal interval between grinding and espresso preparation, and should not be exceeded so as to preserve crema quality . In terms of the control of the grinding process, factors such as the variability of coffee beans, moisture, and the degree of roasting are important. The loss of cell-wall elasticity and the increase of brittleness are mainly induced by coffee bean expansion due to gas production during the roasting process. Arabica and Robusta Botanical species and varieties from different countries and processes lead to heterogeneity in the hardness of coffee beans. The darker the roast of the coffee, the harder and more brittle the beans become, which can then result in a finer grind . Ground coffee tends to oxidize over time, impacting the flavour. The grinding process therefore occurs either as a small scale batch process, such as in a coffee shop, or as a larger-scale process when the coffee is pre-ground and then stored in an inert atmosphere. Recently, home coffee grinders have enabled consumers to purchase whole beans and grind them freshly at home. It is estimated that 15-20% of the coffee is now purchased as whole beans . The grinder used for EC is as important as the brewing system. The basic design of commercial espresso machine grinders is that of a roast coffee bean hopper that gravitationally feeds the grinder mechanism. The beans fall into the centre of an upwards facing rotational burr ring (Figure 1a) and a downward facing fixed burr ring. The distance between the upper fixed burr and the rotational burr controls the espresso grind grade, with the inner section of the burr (Figure 1b) providing the bean smashing and the outer section (Figure 1c) provides the fine grinding. The process temperature is also important during grinding. In particular, a lower rotational speed of the grinding burr gives a reduced temperature grind that result in less bitterness. For this reason, grinders that rotate at 900rpm with high torque characteristics are more favourable than lower quality espresso grinders operating at 1400 rpm. Another cause of increased processing temperature during grinding is worn burrs. In particular, the burr cutting edges shatter the beans and when these become blunt, the burr will pummel and over heat the coffee as it grinds (Figure 2a). To reduce this source of heating during grinding new burrs (Figure 2b) require replacing every 500-600 Kg of throughput. This corresponds to approximately six months’ utilisation in a busy coffee shop. However, burr wear inspection and monitoring is generally left to coffee grinding machine engineers or the skill and knowledge of the professional baristas. Often burr wear and damage is unmeasured and ignored until machine failure. Figure 3 Illustrates the different wear observed on used burrs. (a) Grinding Burr moving half assembly (b) Inner Smashing section (c) Outer Grind section. Figure 1: (a) Grinding Burr moving half assembly (b) Inner Smashing section (c) Outer Grind section. (a) Un-serviced grinding burr (b) New Grinding Burr. Figure 2: (a) Un-serviced grinding burr (b) New Grinding Burr. Used burr with (a) Coffee material build up, (b) Edge damage, (c) Sharpness wear (d) Edge breakdown. 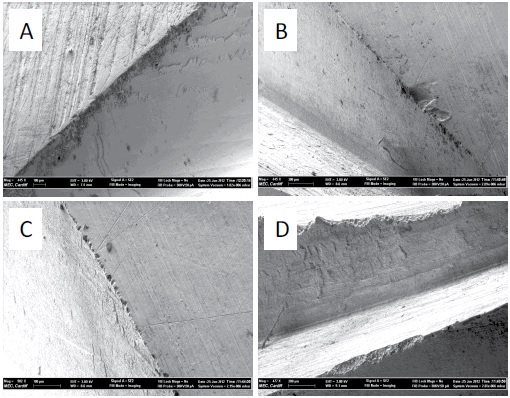 Figure 3: Used burr with (a) Coffee material build up, (b) Edge damage, (c) Sharpness wear (d) Edge breakdown. When the beans are ground the resulting particles centrifugally migrate to the outside of the grinding burr rings and this ground coffee is guided into a shoot that fills a dose chamber. The ground coffee weight of the dose chamber is set to a pre-defined value, with higher quality grinders achieving low dose variability. The distribution of the grounds falling into the dose chamber varies across grinder designs, with the more desirable dose dropping central to the chamber without clumping. The failing of dose coffee grinders is that ground coffee loses much of its flavour in the first few minutes of grinding. Coffee aroma begins to diminish straight after grinding, and when stored in the dose chamber the coffee loses flavour and becomes stale and rancid. This has led to grind on demand techniques and the innovation of Grind-On-Demand espresso grinders (GOD). GOD grinders do not have a dose chamber to store ground coffee. In place of the dose chamber, they are designed with a porta-filter holding bracket that sits directly under the grinding shoot. The placing of the porta-filter handle is what starts the grinding process for the duration of a set adjustable time in seconds. With the change in a consumer trend for home brewing, and the rise of more advanced commercial EC machines, there is a need to characterise the particle size distribution of ground coffee in order to relate this characteristic to variable factors such as the extraction techniques, grind quality, water temperature, water pressure, flow rate, roast type, and bean species. 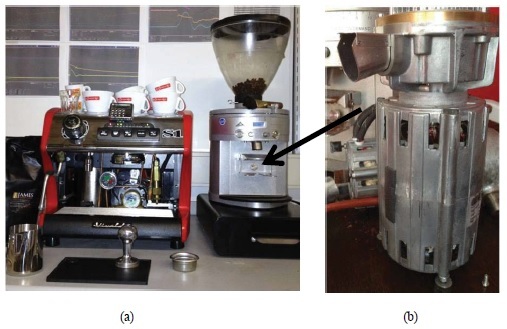 The equipment used for this study is based around the La Spaziale S1 commercial espresso machine and the Mahlkonig K30 espresso coffee grinder (Figure 4a). The settings of both machines control the extraction process, and the interchangeable burrs are housed within the grinding chamber (Figure 4b). The following sections describe the two grinding setups and the two grind size measurements used. (a) Commercial espresso machine extraction and espresso coffee grinder (b) Grind chamber. Figure 4: (a) Commercial espresso machine extraction and espresso coffee grinder (b) Grind chamber. To demonstrate the influence of the ground coffee particle distribution on the EC extraction time, a method to identify the correct ground coffee coarseness was employed. In particular, the method relies on calculating the EC flow rate delivered through the coffee basket. The EC extraction is a function of hydraulic conductivity through the ground particles in the coffee puck. The permeability of coffee mass to be extracted is set by adjusting the coarseness of the coffee grinder. The grinder adjustment method is the process control technique that the Barista uses to avoid over extraction and under extraction. An interview conducted with a professional EC maker using a Mahlkonig K30 espresso coffee grinder and La Spaziale S1 indicated that the time to complete 30 mL of espresso extraction lies around 25 seconds for optimal flavour. In order to produce different samples of coffee particle sizes, first the La Spaziale S1 commercial espresso machine extraction pressure was set to 9 bar and then, the time taken to extract 30 mL of coffee for three different pre-set grinding conditions was recorded. Thus, by adjusting the Mahlkonig K30 espresso coffee grinder settings, it was possible to produce three samples of ground coffee weighting 17 gm each. Using the Barista process control method, it was found that the sample with finer particles corresponded to an EC extraction time of 37 seconds for 30 mL of delivered coffee, while the other two samples led to an extraction time of 17 and 25 seconds respectively. The particle size distribution of the three samples was then measured using precision sieving. A set of two additional grind samples were obtained to assess the repeatability of producing a given particle size distribution with old and new burrs. The method based on grinding the beans for 25 seconds. EC extraction time was obtained using a “Mahlkonig Grind on Demand” commercial coffee grinder with flat conical burr and a “La Spaziale S1” commercial espresso machine. Considered to produce the best flavour according to the professional interviewed the extraction time of 25 seconds at 9 bar pressure was used. The optimised setting experiment considered the repeatability in terms of weight variation using new burrs then using old burrs. The old burs are old in terms of them having achieved a grinding throughput of between 500-600 kg of coffee beans. These burrs were then replaced with new burrs. In total, for each burr pair five samples of coffee grinds were produced. In this study, the particle size distribution of the different samples of coffee grinds was assessed using the wet sieving technique. This technique was performed using a wet sieving weir with a Riley Syntron for vibration control, and Endecotts precision test sieves that conformed to A.S.T.M.E.11 specifications [ISO 3310-1] (Figure 4). The weighed (30 gm) coffee particles were loaded onto the first sieve and the subsequent separation into the following five sieves was aided by water flow. Table 1 shows the aperture sizes for the sieves utilised. Following completion of the separation process, the sieves were placed in an air dryer at 70ºC until the particles were fully dried. Then the particles were removed from the sieves, and weighed. The sieves were then cleaned and the process repeated for a different sample of coffee grind, a total of five samples were used. 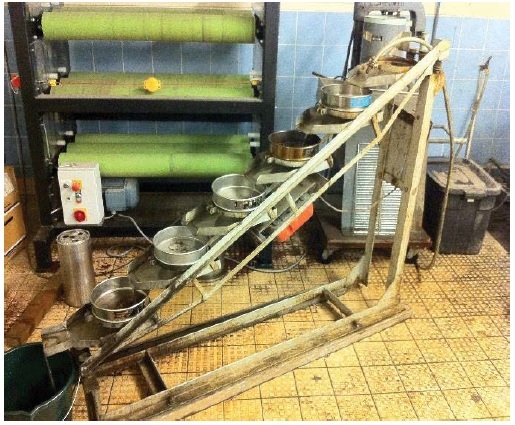 Figure 4: Wet sieving weir. Table 1: Sieve aperture sizes. Laser diffraction is a particle sizing technique for materials ranging from hundreds of nm up to several mm in size. Using ISO standards  and sampling and dispersion standards [34,35], the laser diffraction system can repeatedly measure full size distributions with results generated in less than a minute. In this study a Malvern Mastersizer 3000 laser diffraction system was used to verify the size distribution of two different samples of coffee grinds, the first sample was taken from ground coffee using old burrs and the second from new burrs. To ensure the sample selected for analysis is representative of the bulk material five grind cycles were collected and mixed, and then a 20 gm sample was dispersed in deionised water for measurement. The analysis equipment settings selected for each of the two samples can be seen in table 2. Table 2: Laser diffraction analysis settings. The results reported in Figure 5 show that for all three grind sizes prepared with the first set-up, the highest percentage of the grind weight is above 250 μm for all three samples and that only the coarse grind had any particles above 500 μm (5.7%). Therefore, the results show that even with a 20 second variation in extraction time, the majority of the grind particles are above 250 μm in size. It can clearly be seen from Figure 5 that the grinder settings that led to an extraction time of 37seconds produced a higher amount of finer 45 μm particles so the amount of fine coffee increases the extraction time. Thus, the permeability of the coffee puck is influenced by the size of the particles it consists of. Given that this permeability affects the extraction time and thus the taste, it is important to understand the optimum size of the ground particles that should be achieved. ThreGer iEnCd sgizrien [dm siiczreosn dsi]stribution. Figure 5: ThreGer iEnCd sgizrien [dm siiczreosn dsi]stribution. The aim of this experiment was to assess the particle size distribution of new and old burrs, the old burrs in this case have been is service and delivered a grinding throughput of 500-600 kg. The approach focuses on a single optimised grind setting for a particular EC extraction time. The experiment considered the coffee particle variation of an optimised setting using old burrs then these were replaced with new burrs of the same manufacturer and specification. In this way the experiment will establish that an established grind setting for quality has a natural particle size variation due to the burr quality after use over a period of time. For each burr pair, five samples of coffee grinds were produced and particle size measurements for each of them were obtained with the wet sieving procedure. In Table 3 and Figure 7 for both old and new burrs the highest weight was measured in the precision sieve with an aperture size of 300 μm. It should be noted that this size is just below the extraction bore size of the coffee holding basket which has a 336.6 μm average diameter with a standard deviation (σ) of 40.1 μm (Figure 6). The particles above 300 μm clearly act as a binding size that prevents an increase in the amount of smaller particles flowing out of the basket and ending up in the beverage. (a) Portafilter and coffee basket. (b) Coffee Basket holes (c) 336.6 μm Extraction hole size. Figure 6: (a) Portafilter and coffee basket. (b) Coffee Basket holes (c) 336.6 μm Extraction hole size. EC grind distribution for new and used burrs. 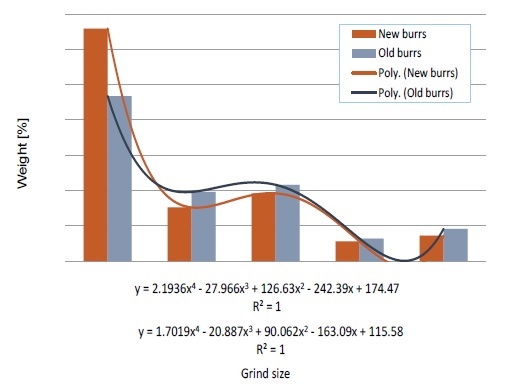 Figure 7: EC grind distribution for new and used burrs. Table 3: EC Optimised grinding size distribution with new and old burrs. It is also observed that among the five precision sieves used, the highest variability in weight measurement was obtained for the sieve with the 300 μm holes. In particular, for the new and old burrs the standard error of the mean (SE Mean), which measures the precision of the population average and thus gives an estimation of the variability between samples, is 0.22 and 0.2 respectively for the 300 μm sieve. For the four smaller sieves the variability for both new and old burrs is reduced as the SE mean is between 0.01 and 0.09. Achieving a small variability in particle distribution can be critical for ensuring a controlled extraction time and coffee/water surface to volume ratio. In particular, it becomes important when considering the extraction time repeatability which corresponds to a specific taste target. Importantly the results show that although the variability between the measurements for each burr is comparable, there is a variation in the weigh distribution between new and old burrs. In particular, the new burrs provide a mean reduction in weight for all of the grind sizes except for the 300 μm size. 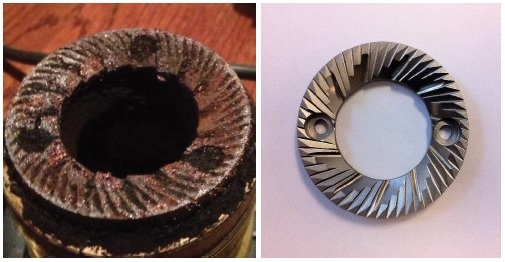 When considering the relationship between the EC taste and the grind distribution the changing of the old burrs for new burrs shows that the weight of particles above 300 μm size can increase by around 30% and the weight of particle sizes between 90 μm and 45 μm size can decrease by around 20%. Thus, the change of the burrs requires a resetting of the process parameters, and throughout the life of the burrs a consideration of the change in grind distribution in relation to burr use is important. Using Laser diffraction, it can be seen in Table 4 that the typical particle size distributions (Dv 50, Dv 10 and Dv 90), surface area moment mean D (3,2) and volume moment mean D (4,2) are all higher for the new blades. Figure 8 illustrates that distribution measurement using laser diffraction is similar to the results from precision sieving. The figure reflects the true distribution of the bulk sample by identifying a bimodal distribution with two distinct peaks present, one in the 300 μm (highest presence) and the other at around 50 μm in size. 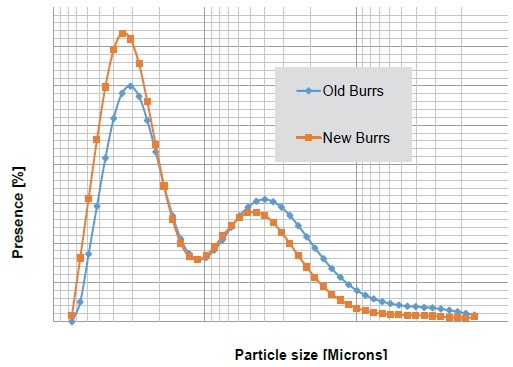 In examining the sieving results (Figure 7) it can be seen that that there is evidence of a bimodal distribution where both the old and new burrs, where the 45 μm particle weight percentage is higher that of the 90 μm particles. The figure 8 also shows a clear shift in size presence distribution between the burrs. The newer burrs have a higher presence of larger particles in the 300 μm size region and the older burs produce smaller particles below the 50 μm size. There is an anomaly in the shift trend where the distribution in the size range of 60 μm-200 μm is the same for both burrs. Thus showing that the wear of the burrs does not influence the ground particles sizes is this region. Figure 8: EC grind distribution for new and used burrs. Table 4: Laser diffraction results. 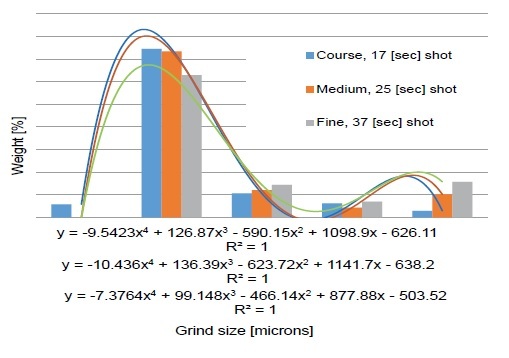 Results for the grind size distribution for the three samples prepared based on measuring the EC extraction time show that for all samples the highest percentage of particle size is above 250 μm. The fine grind setting results in an increased extraction time and thus permeability of the coffee puck is highly influenced by the ratio of grind sizes above 250 μm and between the finer 90-45 μm particles. Ground coffee particle size has traditionally been measured using time consuming sieve-based methods. Using wet sieving the assessment of the particle size distribution for old and new burrs showed that the highest number of coffee particles are above 300 μm. In addition, the highest measurement variability between the burrs was obtained for grind particles above this size. For the four smaller sieves the variability for both new and old burrs is reduced. Wet sieving showed that new burrs result in increased particle size and has thus provided a means of differentiating the grind distribution of the different burrs. In contrast to wet sieving the use of laser diffraction in measuring the particle size of ground coffee is shown to be a quick low cost technique for monitoring the particle size of coffee. In particular, the laser diffraction method identified the size shift measured using wet sieving. In addition to this, the method also identified the bimodal distribution over a far wider range. The particle size of ground coffee is an extremely important parameter in determining the final characteristics of the brewed product. Care needs to be taken during grinding to ensure that the resulting particle size matches the required taste target for the product being made. In addition to taste the grind has a clear influence on the coffee/water surface and the controlled extraction time. There is a variation in the weight distribution between new and old burrs. The change of the burrs requires a resetting and fine tuning of the grind and EC machine parameters, and throughout the life of the burrs a consideration of the change in grind distribution in relation to burr use is important. Monitoring the grinding processes can enable better control and improved product consistency and given the limitations of sieving, laser diffraction is a quick and accurate method for characterization of ground coffee. This characterisation can be used to monitor the wear of the grinding burrs leading to a changing of the old or damaged burrs that will inmprove repeatability in extraction time and consistency in achieving a targeted taste. The authors would like to acknowledge the support of the Advanced Sustainable Manufacturing Technologies (ASTUTE 2022) project, which is partly funded from the EU’s European Regional Development Fund through the Welsh European Funding Office, in enabling the research upon which this paper is based. Further information on ASTUTE can be found at www.astutewales.com.